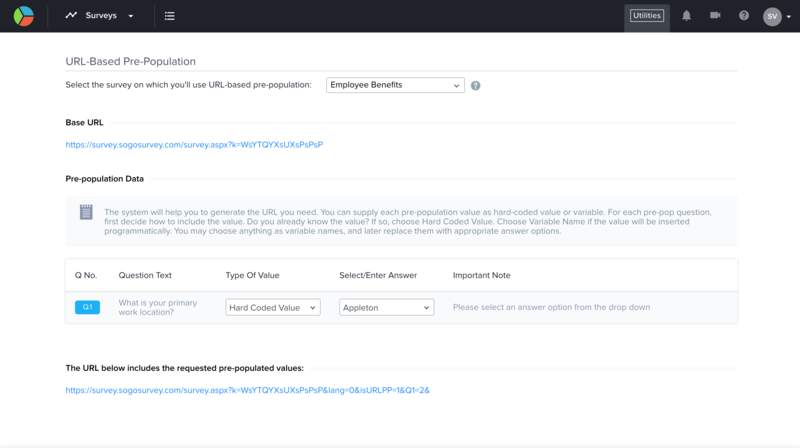 If you would like to create multi-use links that include pre-populated data, this feature is for you. Maybe you don’t have contact information for everyone you would like to survey, so you can’t send a direct email. However, you know enough information to answer one or two questions for each group of participants. Each school site, for example, can have its own link, so participant responses will be connected to their schools automatically. On the Utilities page, select URL-Based Pre-Population. Choose your survey from the dropdown menu. Choose Hard Coded or Variable values to pre-populate in the survey for each question being pre-populated. Click on Generate URL Now to complete the process.